HAHAHAHA! This is a great thread.. I have to do my own now! 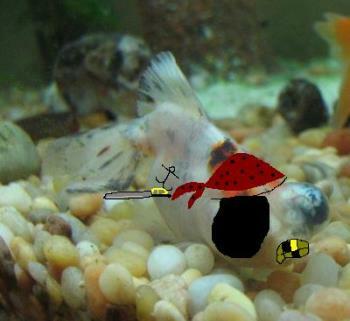 Come on everyone -- get in the Halloween spirit and dress up your fishies! Happy Halloween from da Islands, mon! and Jack all dressed up as a Pirate!! "ARRRGH! 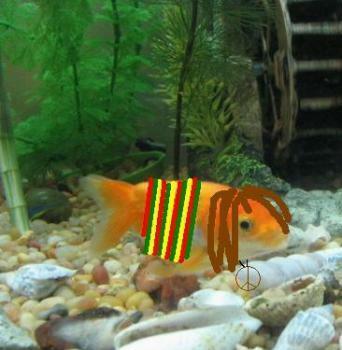 !, gimme tha fish flakes and nobody gets hurt!" We should like have a costume contest or something! I put my dog in one last nite at vvvv and she won 4th place! I just got 2 new baby ryukins -- Ill have to costume them in Paint Shop Pro tonite! Love the gold tooth! nice touch....is that a tattoo? 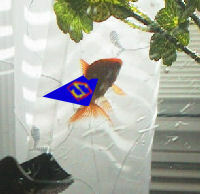 Koko says " Need More Brains"
Kris I'll post a betta pic later.I'll have to go on my pc as no betta pics on my laptop. Ragman says " Fangs for the compliment but I need to go the blood bank "